Today I learned of the passing of a great physicist, friend and colleague, Michel Baranger. Professor in the MIT physics department, Michel was a student of the great physicists Hans Bethe and Richard Feynman and an important contributor to theoretical nuclear physics and quantum chaos. Michel was also a modest person and a pleasure to interact with. Our association began when he attended as a student my first course on complex systems at Boston University in the early 1990s. He honored me by calling me his teacher. He was a founding member of the NECSI board of directors serving long after he moved in retirement to Arizona. With his postdoc, long since a professor, Marcus d’Aguiar, we worked together on fundamental ideas about complex systems as well as applications to evolutionary biology. Michel's engagement with research was ever a process of building a deep understanding, focusing on key ideas, and the way we can frame them mathematically. I would pick out two papers of his to mention. The first provides a mind broadening perspective on how chaos revolutionizes traditional physics thinking, the second shows how we can use chaos to understand a key paradox of traditional physics, the way systems go toward equilibrium. Despite ill health in recent years he continued to visit us in Boston and engage in research, some of which will never be completed. We will miss him. Michel Baranger, "Chaos, Complexity, and Entropy: A physics talk for non-physicists"
I first met Michel in Sao Paulo, Brazil, in 1985, 29 years ago. His ideas on chaos and periodic trajectories inspired my PhD research and led me to the US for a postdoc at the MIT from 1987 to 1989. Among so many things, Michel taught me path integrals, which he had learned directly from Feynman, and which I later taught my own students. He taught me to think deep about things, to look for new solutions, in different directions. The postdoc ended with a beautiful cross-country trip from Boston to Santa Barbara, CA, just Michel, my wife Denise and me, in his Subaru. Michel was so systematic that it took us hours just to pack the car: every suitcase and bag had to be put in the best possible position to maximize space. And it did at the end! The trunk was so perfectly packed that it looked like a Lego toy. That was Michel. Everything had to be as perfect as possible and he would work hard to make it happen. The paper we started in 1989 took 12 years to get finished and published, but is one of my main contributions in Physics. Our best years together, however, were spent in Boston, at NECSI, working with Yaneer and Hiroki. Michel was already retired from MIT, living in Tucson. We would both go to Boston and camp at the old NECSI house, near Harvard Square. Yaneer would send everybody home at 6pm and the house would become our home until 8am of the next day. Michel would sleep in the couch and I on a mattress on the floor, listening to the low humming of the computers. We used to chat for hours, about Physics, Biology and so many things. Those were glorious days. Our work in Evolution started there. As the years passed, Michel grew older and his health declined. His mind, however, remained sharp. His memory, incredible. From 2001 to 2009 we met several times at NECSI and in Brazil, where he used to visit me in May. Now this is all over and I will miss every bit of it. The last time I saw him was in December 2013, when I visited him for a week in Tucson. We said goodbye in front of his house, where I took a taxi cab to the airport. We hugged for a long time and he had tears in his eyes. I think he knew that would be the last time we would see each other. I had no idea. Michel Baranger died on October 1, 2014 at the age of 87, after a short illness, surrounded by his children and grandchildren. The second of eight children, Michel was a native of Le Mans, France. He graduated from the École Normale Supérieur in Paris in 1949, and then received the Ph.D. in Physics from Cornell University in 1951. There he met and married fellow graduate student, Elizabeth Urey Baranger. They moved to the California Institute of Technology for post-graduate research in physics. In California, friends introduced Michel to hiking and backpacking, and he developed a great love for the outdoors. Michel next took up a position in the Physics Department at the Carnegie Institute of Technology (now Carnegie Mellon University) in Pittsburgh (1955-1969). 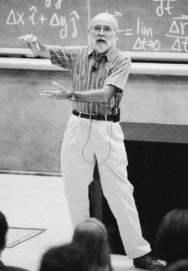 Michel moved to the Massachusetts Institute of Technology as Professor of Physics (1969-1997), where he was known as a devoted teacher and meticulous researcher. Michel maintained an ongoing research affiliation in France with the Institut de Physique Nucléaire at Orsay, near Paris. After his retirement, he was affiliated with the New England Complex Systems Institute and had an adjunct appointment at the University of Arizona, Tucson. Michel's research career in physics began with his thesis work in quantum electro-dynamics, an important calculation of contributions to the Lamb Shift, with mentors Hans Bethe and Richard Feynman. His research in the late fifties and sixties in plasma spectroscopy and nuclear collective motion had particular impact. More recently, he worked in the areas of semi-classical quantum chaos and speciation as a complex system. Michel loved to travel and experience nature. He hiked and backpacked most summers in the Sierra Nevada mountains of California, and also hiked in the Alps, Alaska, the Himalayas, and the Andes. He traveled to Europe, Africa (where he visited his sister in the Congo), the Galapagos, Antarctica, Greenland, and New Zealand. During his retirement, Michel moved to Tucson, Arizona, a place where he could continue to enjoy his great love of hiking and the outdoors. He was one of the original residents of Academy Village, a retirement community for active adults. Michel leaves behind many close friends, especially in Boston where he lived for many years, devoted newer friends in Arizona, and many research colleagues and former students. He maintained friendly relations with his former wives, Elizabeth Urey Baranger (mother of his children), Anne Gerard, and Mary Lee Baranger. Though Michel made his home in the United States, he remained close to his family in France and visited regularly. He leaves behind sisters and brothers, Françoise, known as Sœur Marie Thomas, Patrice (Monique), Monique Pasquier (Pierre, predeceased), Laurence Graffin (Denis), Martine, and Marie-Bénédicte, and sister-in-law Christine Baranger, and numerous nieces and nephews. His dear brother, Pierre, predeceased him. Michel is survived by his children, Martin Baranger of Boston, MA, Harold Baranger (Meg Anderson) of Durham, NC, and Anne Baranger (John Hartwig) of Berkeley, CA, and four grandchildren (David Anderson Baranger, Hannah Anderson-Baranger, Amelia Baranger-Hartwig and Pauline Baranger-Hartwig). Contributions in Michel's memory can be made to the Sierra Club Foundation, an organization he supported for sixty years. A memorial service for family and friends will be held in Tucson at a future date; please contact the family for specific information.